Orchard oriole bird song. 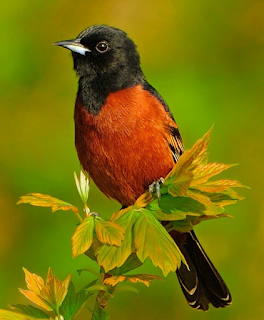 Orchard oriole (Icterus spurius) is the smallest North American species of icterid blackbird. The subspecies of the Caribbean coast of Mexico, I. s. fuertesi,is sometimes considered a separate species, the ochre oriole. Male sings in spring to attract a mate. Often not strongly territorial; in some cases, more than one pair may nest in the same tree. Also sometimes nests in the same tree with Eastern Kingbirds. Nest site is in tree (usually deciduous) or tall shrub, rarely in tall dense marsh growth. Often 10-20' above ground, can be much lower or higher (3-70' up), typically placed in fork of horizontal branch, sometimes in clump of Spanish moss or other site. Nest (built by female, possibly with help from male) is a hanging pouch or basket, not as deep as some oriole nests, woven of grass and plant fibers, lined with fine grass and plant down. Diet While in breeding season, they eat insects and spiders. When the season changes, their diet also includes ripe fruit, which quickly passes through their digestive tract. During the winter, their diet consists of fruit, nectar, insects and seeds. #Edisi lagi males nulis,males translator,Thanks. 1 Komentar untuk "Orchard oriole song"